Ah, the tarty and sweet delight of fruit is always satisfying but when paired with Prosciutto di Parma, it’s pure heaven. Prosciutto and melon is a classic and this tropical delight will have you dreaming of lounging on a hammock with drink in hand. Be creative with the fruits you choose and every bite will be a sweet surprise with an ideal balance of savory. 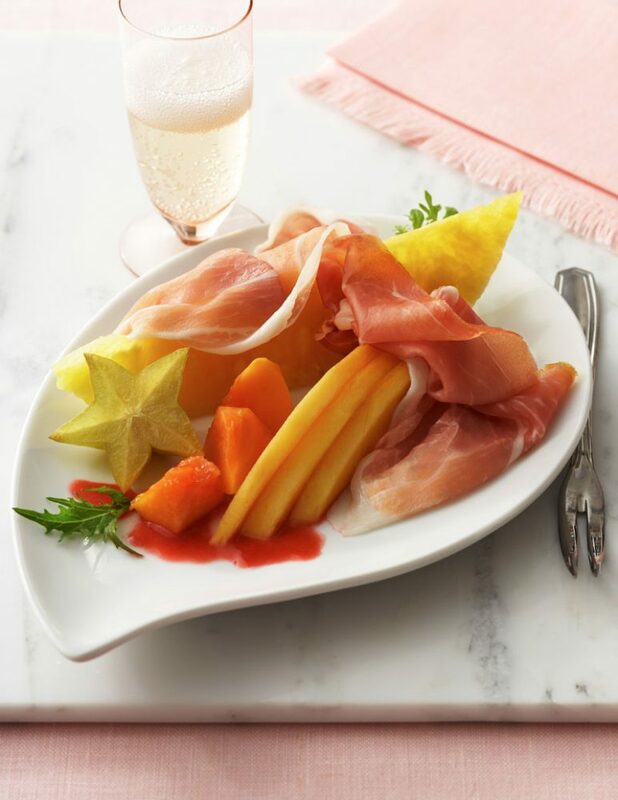 Create this prosciutto and melon plate for an after-dinner dessert or sweet snack any time of day! A colorful and appetizing array of cut fruit—two long, thin slices of fresh pineapple arranged on a rectangular platter standing on their long edge with two perfect slices of Prosciutto di Parma draped over them, surrounded with melon balls, mango slices, papaya chunks, a halved fig and sliced starfruit. Some leafy greens for accent.